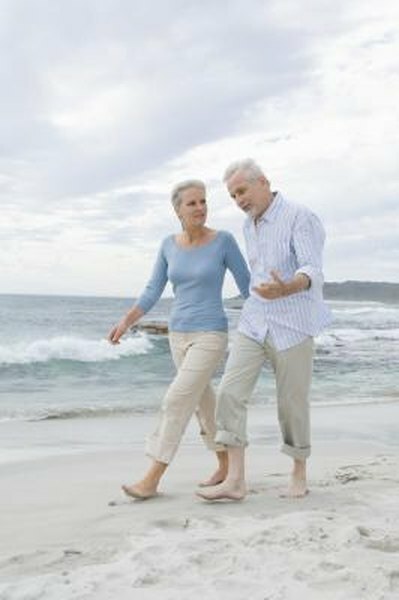 The death of a husband can shatter dreams of a retirement together; however, it doesn't have to leave the widow penniless. 3. Can I Draw SSDI & Retirement? A couple works for decades, saving and planning for a comfortable retirement together. Sometimes, however, the husband dies, leaving a widow to undertake those plans alone. Although nothing can make up for the loss of a spouse, a widow often can collect at least some of her husband's public and private retirement monies. If you're 60 or older and have been married for at least nine months, you're eligible to receive between 71 percent and 100 percent of your husband's Social Security benefit as a widow's benefit. The amount depends upon your age when you start collecting it. If you're already receiving your own Social Security benefit, Social Security will pay that first, then supplement it to take it up to the widow's rate. For example, if your husband's Social Security check was $1,500 a month and your check was $1,000, you would receive $500 extra as a widow, if you are at full retirement age. If, however, your husband's Social Security check was $1,000 and yours is $1,100, you will continue to receive your check, but no additional widow's benefit. If you are not receiving benefits, you can opt to take your husband's benefits and delay starting your own. If you remarry, any widow's benefits end. If your husband worked for the federal government under the Civil Service System, unless you specifically waived your rights, his pension was paid out as an annuity with survivor's benefit, which means that you will continue to receive a percentage of this benefit as a widow. You receive this benefit regardless of any other retirement income you may have of your own, even if you also have a Civil Service pension. You also continue to receive the benefit if you remarry. If your spouse died as a result of an injury received while on active military duty, you may receive Dependency and Indemnity Compensation. This money is paid in addition to any other retirement you may have. If you are a low-income widow of a veteran who served at least 90 days of active duty or one day during wartime, you may receive a Wartime Service Pension. If you remarry, you lose military pension benefits. Private pensions, or those received from private employers, also are paid out as annuities with survivor benefits unless both you and your husband specifically signed a waiver. Although the terms of these pensions vary slightly with the employer, federal law guarantees you at least 50 percent of your deceased husband's retirement check. Your husband's 401(k) will pass to you automatically. An IRA passes to the designated beneficiary. Receipt of monies from private pensions, 401(k)s and IRAs is independent of any other income you might have or whether or not you remarry. Maximizing your retirement income, as well as protecting your spouse if you die, requires careful planning. When determining your retirement age, develop more than one budget -- one based upon both your retirement incomes, one based upon what happens if the husband dies and one based upon the wife dying. This will help you identify any gaps to address. If you're recently widowed and have Social Security of your own, consider carefully when to begin collecting your husband's. Claiming one benefit early and waiting to claim the second until it reaches its maximum value is generally the best strategy, according to Journal of Financial Planning. Can an Ex-wife Receive Social Security Benefits From a Dead Husband?